Lagowski has been recording under this name since 1992, and has had releases on Disturbance (Italy) and Deltra (UK). This recording, on the Ash International label, reflects man’s fascination with “what might be out there”. Utilising speech, NASA recordings and radio broadcasts, it highlights the covert activities of the American authorities in a field which is, in fact, within our domain. Four tracks, Gathering, Concealment, Knowledge and Journey, bathe the listener in a spectrum of pulsating and ever-evolving sound. The listener is left transported with a yearning for spatial fulfilment, fuelled by the excitement of discovery. Following recent revelations concerning the ease with which individuals can access high security data, Knowledge is particularly relevant in exposing the farcical levels of secrecy which surround any investigation or research into extra-terrestrial intelligence. S.E.T.I. was an international organisation dedicated to the Search for Extra-Terrestrial Intelligence, recently becoming the High Resolution Microwave Survey. S.E.T.I. was set up in the 1970s by Carl Sagan and Frank Drake, initially funded by US Congress. Recently their grant has been axed and they now rely on voluntary donations. 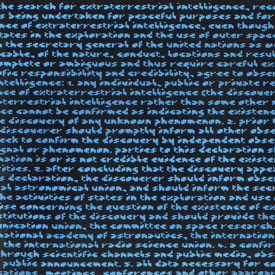 Its purpose remains to establish a protocol of behaviour on contact with extra- terrestrial intelligence, in an attempt to safeguard any discoveries for the whole of mankind and not just the eacutelite. There are many international signatories to the S.E.T.I. Protocol, including the U.N., most Western governments and scientific establishments, as well as private individuals and groups.